Are you getting fatigued very quickly these days or frequently passing stools of abnormal color? Watch out, for you may be suffering from Gastric Antral Vascular Ectasia (GAVE). Read and know more about the types, causes, symptoms, diagnosis and treatment of this syndrome. It is a rare disorder that primarily affects the older population. An uncommon but significant cause of acute or chronic gastrointestinal blood loss, it is mainly associated with dilated small blood vessels in the antrum (abdominal chamber) or the last section of the stomach. The distinctive endoscopic appearance of this condition has earned it the name “watermelon stomach.” The stomachs of GAVE patients are observed with streaky long red sections that closely resemble stripes on the surface of a watermelon. This gender-specific syndrome is more common in females than males with a ratio 5:1, and the average age of occurrence is generally 70 years. Patients with obscure gastrointestinal hemorrhage account for 3.9% of the population suffering with GAVE. It manifests mostly as an iron deficiency anemia due to gradual loss of blood. Although first described in 1953 by Rider, the disease was actually discovered a year earlier – in 1952. Wheelar was the first person to diagnose this condition in 1979. However, it was eventually defined in 1984 by Jabbari and colleagues. In this form, prominent erythematous streaks (that traverse the antrum of the stomach and converge on pylorus) are observed. These streaks closely resemble the characteristic stripes of a watermelon. This condition is most commonly associated with autoimmune and rheumatologic disorders, such as Systemic Sclerosis and Anemia. In this form, Angioma (benign tumors consisting of small blood vessels) are found to be present near the antrum. This type of GAVE is typically associated with cirrhosis and portal hypertension. It is found to arise in 30% of all cases of GAVE. Patients of this condition normally exhibit a wide range of symptoms which can intensify on the basis of the severity of the syndrome. Acute abdominal bleeding is the most common sign of this syndrome. Patients often observe this bleeding in the form of black, tarry, or fresh bright red stools. It is a common type of anemia where the body does not have sufficient iron to build healthy red blood cells. 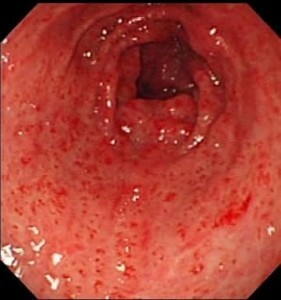 Lack of absorption of iron or loss of the mineral due to intestinal bleeding may aggravate this syndrome. Fatigue, weakness, and shortness of breath are some of the common characteristics observed in patients. This particular chronic liver disorder is said to affect around 30% of the population suffering from GAVE. It is characterized by replacement of liver tissue by scar tissue and regenerative nodules, leading to loss of liver function. An obstruction in the liver leads to an increase in blood pressure in the veins of the portal system. It is often associated with liver cirrhosis, causing enlargement of the spleen and collateral veins. Patients often complain of pain in the chest region that could be related to many different conditions including GAVE. A proper diagnosis is important for providing treatment to such patients. These are irregularities of the heartbeat such as a rapid or abnormal heartbeat. Patients usually get a feeling of the heart pounding and beating at a faster pace. Also referred to as chronic daily headache, it occurs in over 15 days in a month. It is a very common symptom of GAVE. The exact causes of this disorder have not been found out. However, some hypothesis has been formulated regarding the occurrence of the condition. These are congenital vascular lesions that make the blood flow directly from the arterial to the venous system without passing through the capillaries. Untreated AVMs may lead to symptoms of GAVE, such as chronic anemia or severe abdominal bleeding. The lesions may even result in dark, tarry stools (due to the presence of blood) that are clinically denoted as “melena”. Strong gastric peristaltic waves may cause severe mechanical strain on the dilated blood vessels of the antrum. In this condition, there is an excess secretion of gastrin by the antrum of stomach that further stimulates the production of gastric acid, which is required for digestion. Abnormal amount of gastrin may cause spindle cell proliferation, leading to a rise in venous hydrostatic pressure inside the stomach. The neuroendocrine cells (responsible for releasing hormones into the blood) may produce high levels of vasoactive substances, such as vasoactive intestinal polypeptide and serotonin, which may lead to vascular dilation. Abdominal injury may damage the vital abdominal organs and always involves a risk of severe blood loss and infection. A host of cardiovascular disorders may be responsible for abdominal bleeding associated with this condition. In most cases, reduced blood supply to the heart muscle due to coronary artery disorder causes dilation of blood vessels in the antrum. This functional gastrointestinal disorder is generally characterized by abdominal pain and altered bowel movements and has been suspected as a rare cause of this condition. Inappropriate immune response against the tissues of the stomach may cause injury to the abdominal lining. The body starts producing antibodies that attacks such tissues, leading to inflammation and damage. Diagnosis of this ailment might be challenging in patients with hepatic or renal disorder. This is due to the fact that there are other causes of abdominal bleeding in these liver disorders. However, there are a few diagnostic methods that may help in the proper diagnosis of this syndrome. In this non-invasive technique, a thin tube with a small camera fixed at the end (known as endoscope) is orally infused into the stomach. The test shows longitudinal strips, such as those observed over watermelons, on the antrum. 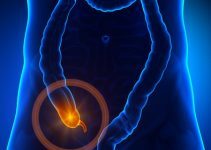 The endoscopic appearance is often mistaken as hemorrhage or severe gastritis, which usually delays the diagnosis and initiation of an appropriate treatment. It is normally done along with endoscopy, where small samples of antral tissues are collected and sent for further examination. The tissues are minutely examined for any kind of damage. In this diagnostic method, surgical exploration of the abdomen is performed to determine the exact cause of abdominal bleeding. It is generally done in cases involving liver or other organs. The goal of this test is to detect presence of blood in stool, due to abdominal bleeding. Passage of dark, tarry or bright red stools can be indicative of any form of disorder in the gastrointestinal tract. However, an endoscopic examination following a stool test is generally advised by physicians as there can be other factors responsible for the formation of such bloody stools. Treatment of GAVE ranges from symptomatic therapy to surgery and depends greatly on the severity of the syndrome. There are many non-steroidal anti-inflammatory drugs like aspirin, ibuprofen as well as anticoagulants like clopidogrel that may lead to mucosal bleeding and irritation. Patients are generally advised to avoid such medications which might aggravate the syndrome. Iron supplements are available in various pharmacological forms, such as iron sulfate or in combination with gluconate, dextran and other salts that are orally administered to the patients. These supplements help prevent and cure low iron levels in the body that occur during iron-deficiency anemia. Transfusions can provide patients with temporary benefit by restoring healthy blood levels. However, it must be conducted within a reasonable safety level. It is a common endoscopic procedure that is predominantly used to control bleeding in the gastrointestinal tract. In APC, a jet of ionized argon gas is directed through a probe that is further passed through the endoscope. The probe is placed at some distance from the bleeding lesion inside the stomach, and argon gas is ejected then ionized by a high voltage discharge. High-frequency electrical current is then conducted through the jet of gas that causes coagulation of the bleeding lesion on the other end of the jet. This method is considered to be very effective but only for a short duration, and is responsible for the maintenance of hemoglobin level. Ablation therapy is a minimally invasive procedure that removes the lesions or damaged tissue in the abdominal region. The removal is done by using an endoscope in combination with other treatment methods like cryotherapy, photodynamic therapy or radiofrequency ablation. In this type of surgical procedure the lower portion of the stomach is removed. Patients, who show least or no response towards other treatments, generally opt for this method. Individuals suffering from GAVE should eat a healthy diet that does not result in irritation in the lining of the stomach. Patients, especially those suffering from liver cirrhosis, should strictly avoid alcohol consumption. Spicy or oily foods, that normally cause burning sensation in the stomach, should also be avoided. A typical diet for a GAVE patient must comprise of whole grains, vegetables, fruits, and high fiber foods. Gastric antral vascular ectasia does not cause any serious complications. However, it is essential for GAVE patients to undergo an early diagnosis to ensure a faster recovery from this discomforting syndrome. An endoscopic management can successfully treat the condition.